As alcoholics, we often tended to gulp drinks faster than other people did. And we were seldom likely to overlook the last few drops in the cocktail glass, or the last few slugs in the bottle. Perhaps most readers already get the point: It is not always easy for us to put down an unfinished page, chapter, or book we are reading. There seems to be almost a compulsion to go on to the end, instead of taking only a page or a chapter or two a day and leaving the rest for another session. Not that this tendency is altogether bad. In getting over a destructive obsession such as drinking, it’s sensible to replace it with a benign one, such as a compulsion to seek more and more knowledge and help for a drinking problem. So read on, if you like. It’s a whole lot healthier than boozing. But when you reach the end of this section, you might want to try something. Put this book aside and review your day. See how many times you could have slowed down a bit or taken things a little easier if you had thought of it. The slogan ‘Easy Does It’ is one way we AA’s remind each other that many of us have tendencies at times to overdo things, to rush heedlessly along, impatient with anything that slows us down. We find it hard to relax and savor life. When one of us is in a dither to get something done or get somewhere in a hurry, a friend may gently remonstrate, ‘Easy Does It,’ remember?” Then there’s often a flash of annoyance at the adviser. And that indicates the advice must have hit home, wouldn’t you say? Yes, we know that impatience today is by no means limited to alcoholics. As the rate of change in our civilization accelerates, more and more people feel pressed for time and harried to hurry up and catch up with… With what? With whom? Such pressure does not push most drinkers into alcoholism, as anyone can see. Only a small percentage of drinkers develop our problem. But those of us who did often find we share a need to learn how to relax, how to pace ourselves in a healthy way, how to enjoy small gains and even the simple pleasures along the way—in short, how to enjoy the journey, instead of just fretting until we reach our destination. The horizon stays there. Sometimes, it pays to stand still and gaze at it, for the refreshment of the long look. Some of us repeatedly find, too, that we have bitten off more than even a hippo could chew. We keep taking on more commitments than any one person could handle. Probably, we could learn a great deal about this from certain recovered cardiac patients. Many of them manage to be vigorously and productively active in a measured way which avoids harassment, overexertion, and frantic enslavement to the clock. Some of us work out routines to help us keep our goals realistically within the realm of possibility. We may make up a list of things we’d like to get done today, then deliberately discard half or more of it. Another day, another list. Or we intentionally schedule things pretty far in advance, teaching ourselves to neglect them, just as deliberately, until their time comes. Others of us find that lists and schedules can become tyrants, driving us to finish every item, no matter how much time and effort it takes. So we swear off lists for a while. No longer pushed by their dictatorship, we can learn to move at a more spontaneous, leisurely pace. For a great many of us, sitting quietly alone for 15 or 20 minutes before starting each day’s activities helps us set out in a relaxed, orderly frame of mind. Some of us use specific methods of prayer or meditation which we have found particularly well suited to this purpose. And maybe several times during a hectic day, we manage to sit undisturbed, with eyes closed, for a five-minute break, then resume work refreshed. For some of us, it is easier to slow ourselves down if we have the help of another person. We may be unable to generate our own peace, but sometimes we can make ourselves sit quietly and listen to a friend who has achieved a measure of serenity. Full attention to someone else helps restore our equilibrium and gives us a new perspective on our own lives, so we may see that they don’t have to be a rat race. More formal, institutionalized sessions of peace in the company of others (such as religious services, retreats, and the like) are particularly rewarding for certain people. Or we may simply decide to set out earlier in the day than we used to, so we can move with less hurry. With a little thought, we may be able to work out personal timetables that are less jammed, more flexible, and thus less grinding and goading. When we do find ourselves up-tight and even frantic, we can ask ourselves occasionally, “Am I really that indispensable?” or “Is this hurry really necessary?” What a relief to find the honest answer is frequently no! And such devices actually serve, in the long run, not only to help us get over our drinking problem and its old ways; they also enable us to become far more productive, because we conserve and channel our energy better. We arrange priorities more sensibly. We learn that many actions once considered vital can be eliminated if they are thoughtfully reexamined. “How much does it really matter?” is a very good question. 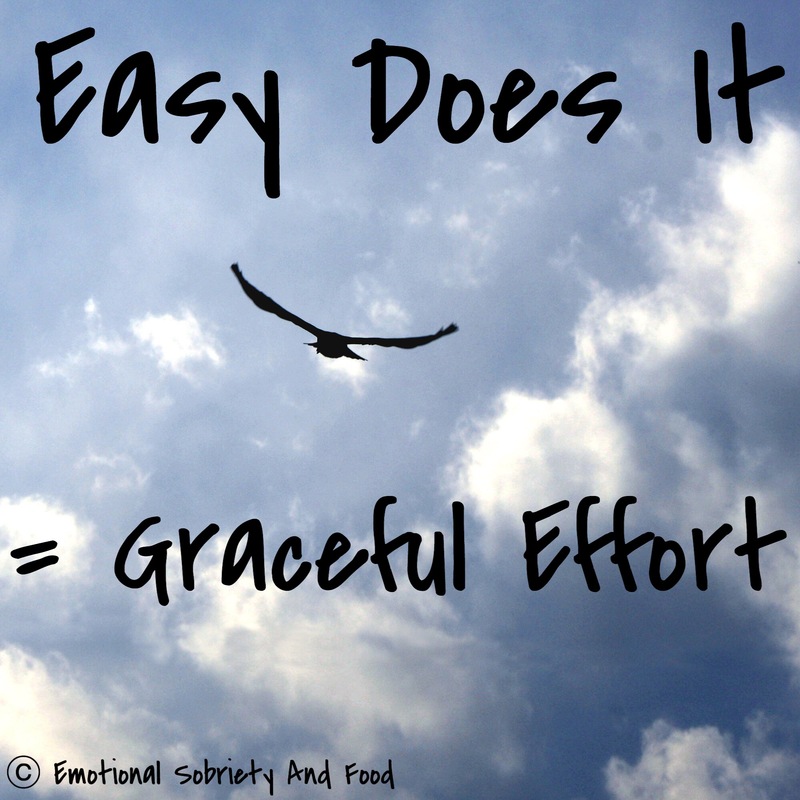 Of course, “Easy Does It” gives us no license for procrastination or being late for appointments. There are things that should not be put off until tomorrow (and tomorrow and tomorrow)—such as stopping drinking. But there are other things better delayed beyond this 24 hours, to be tackled when we are better equipped to handle them. Once, an extremely sick and agitated alcoholic called an AA office and said she had to have instant help! She was asked whether she could hold on 20 to 30 minutes until someone could be gotten to her. Our heart goes out to anyone in that dire condition. We know all too well how it feels. Help did arrive for the excited caller, within the hour, and now she tells the story on herself as an example of what she used to be like. It is almost incredible, when you see how composed yet energetic, how calm but alert she is now. If a strong inner core of peace, patience, and contentment looks at all desirable to you, it can be had. Remind yourself once in a while that maybe “Easy Does It” is this day’s ideal speed. The change can start right now, remember?